With its phenomenal view from the top of 30 Rock, Bar SixtyFive welcomes the changing seasons in a more sweeping way than most NYC venues, as the long days of summer shift to romantic fall evenings overlooking Central Park, the skyline and beyond. Chef Mathew Woolf and his team also take cues from the harvest as they add new items to the menu. Front + Center talked with Woolf, Bar SixtyFive manager Corey Creason and Amy Devahastin, Rainbow Room associate director of beverage and certified sommelier, to find out what to expect this fall. They also provided the recipe for a drink worthy of a holiday feast, the Company's Coming (pictured above), which launches at the bar Wednesday, September 19. Both local and global inspirations can be seen in the new dishes. Woolf tells us, "Some highlights for the fall menu include cauliflower cheese, made using beautiful whole roasted baby cauliflower, New York cheddar foam and fresh truffle. Another dish will be potato foam with pumpkin curry ice cream." And creations such as the clam chowder served in a Quahog clam shell will be perfect for a cozy fall opener. Cocktails will feature "quintessential autumnal flavors," Creason says, such as New York State apples in the Granny Smith's Sour. Two that are "definitely going to turn some heads" are the gin-based Toadstool Tipple, infused with morel and candy cap mushrooms, and the Thanksgiving-inspired Company’s Coming. 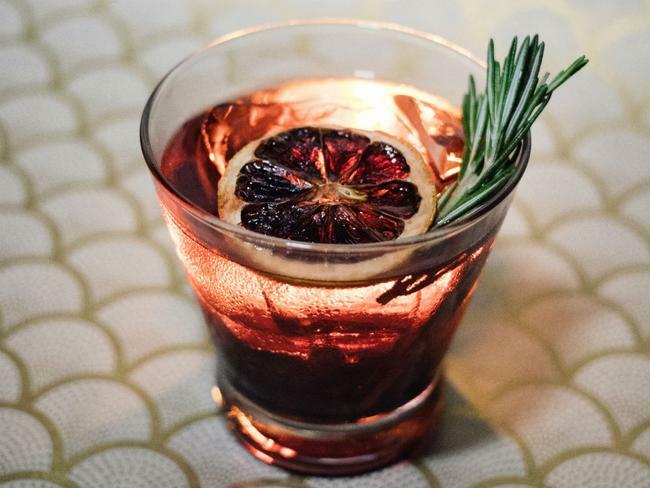 Along with cranberry bitters and spiced vermouth, it's prepared with a "special technique to impart some of the savory flavors of duck fat to a smoky, floral mezcal cocktail." Of course, SixtyFive also prides itself on its Manhattans. "The secret is all in the whiskey," Creason says, a "tantalizingly spicy" one called Ragtime Rye that's made in Brooklyn by the New York Distilling Company. Tasting Notes: Conceptually, this cocktail is a take on "Thanksgiving in a glass." Washing the mezcal in duck fat imparts a savory, almost gamey flavor. (See the end of the recipe for more info.) The vermouth is infused with classic poultry herbs including rosemary, thyme and a hint of cinnamon to pair with the aroma of the fat-washed mezcal. A little demerara sugar adds an earthy sweetness that marries all of the flavors together, and a few dashes of cranberry bitters provide a hint of tart acidity as a finishing touch. 0.75 oz rosemary/thyme/cinnamon-infused vermouth (Lillet Rouge). Method: Combine ingredients in a mixing glass with ice and stir until well chilled (40-50 revolutions). Strain into a rocks glass over a two-inch cube. Garnish with a flamed orange twist and a candied orange slice. A note on fat washing: Fat washing is simply a method of infusion. This method involves combining a spirit with a fat that is in a liquid form like olive oil or melted butter. The mixture is then agitated and left to separate before it is moved to the freezer so that the fat can solidify for easy removal. The liquid is then filtered several times through coffee filters to remove any remaining solids and what you’re left with is a spirit that is now imbued with the flavors of the fat you used for the wash.